Around 2,500 years ago, Greek philosopher Heraclitus of Ephesus had pronounced: "The only constant in life is change." Think of change as a never-ending game - 'The Change Game', if you like. As in every other sphere, The Change Game resonates through the 2011 edition of Business Today's annual special issue on business schools, or B-schools, as well. So, ladies and gentlemen, let us begin from the very top. The familiar order of A-B-C - or Indian Institute of Management (IIM) Ahmedabad, IIM Bangalore and IIM Calcutta - played itself out eight times in the 11 earlier rankings we have done since 1998. But in this year's BT-Nielsen ranking of India's Best B-schools, the top trio has shuffled into B-C-A. 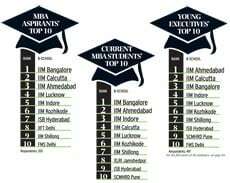 For the first time since 2002, IIM Bangalore finds itself perched at the top. What has helped it most is its unmasked ambition for growth and an increased thrust on research. Another significant change is in our methodology to rank the B-schools. For the past eight years, the responses of a perceptual survey by our partner Nielsen were wrung through its 'Winning Brands' model to arrive at brand equity scores to rank the B-schools. This year, too, we did a perception survey, but did not apply the Winning Brands model. Instead, scores were assigned to the responses of the five groups of stakeholders - MBA aspirants, current MBA students, young executives at companies, recruiters (human resource heads and functional heads), and permanent faculty of B-schools - across various parameters. These scores were aggregated, the highest scorer was assigned a score of 100, and the remaining scores were indexed to it. This makes the scoring more linear and simpler. In the context of business education in India, an MBA degree from an IIM has always been the key to riches, glory and recognition. This year's ranking of the Top 10, too, suggests that at a time of turbulence in the economy, global and local, brand IIM is considered the safe house. For the first time ever, the top six colleges are all IIMs. The B-C-A trio is followed by IIM Indore (IIM-I), IIM Lucknow (IIM-L) and IIM Kozhikode (IIM-K), in that order. 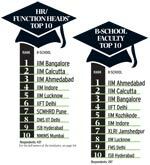 While IIM-I and IIM-L are familiar members of the Top 10 club, IIM-K rejoins it after nine years (see Dramatic Rise). IIM Shillong, too, joins the snoot club in style this year, catapulting to #9 from #15 last year. Naturally, others have wilted. The Indian School of Business (ISB), Hyderabad, a top-tier school in the league of the IIMs, has dropped one slot from #7 to #8. The two institutes that share the #10 rank, Faculty of Management Studies (FMS), University of Delhi, and XLRI School of Business and Human Resources, Jamshedpur, have also taken a tumble, from #4 and #6, respectively, last year. 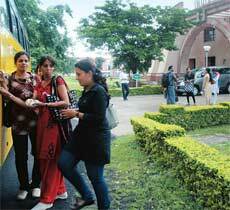 Only Indian Institute of Foreign Trade (IIFT), New Delhi, shot up to #7 from #11 last year. That it is increasingly gaining equity in the B-school ecosystem is evident from the fact that last year, too, it had jumped to #11 from #17 in 2009. Backing these changes are vital insights on crucial shuffles at the very foundation of the system that schools the business leaders of tomorrow. Hard questions are being asked: Do our schools shape enough young leaders? What measures are the B-schools taking to reform their pedagogy? Why will our young, bright talents opt for Indian institutions, if they can study abroad? What will the entry of foreign B-schools mean for their Indian counterparts? In its golden jubilee year, IIM-A has come up with some answers of its own. "Our vision is to build on 'thought leadership', and come up with new paradigms in management thinking which are different from western models," says Samir K. Barua, Director, IIM-A (see Nifty at 50). Barua's statement comes at a time when leaders such as Jairam Ramesh in governance and N.R. Narayana Murthy of Infosys have accused top institutes of not doing enough research. Others such as Pritam Singh, Director General, International Management Institute, or IMI, suggest Indians have clung slavishly to western models of thinking that are inadequate for Asia. Happily, good institutes admit to their need for research, and some have already initiated moves to create intellectual property. For instance, IIM-C has set up a finance lab that gets real-time data and news on companies from different stock exchanges. These are then converted into sentiment scores to predict share price movements. Unfortunately, "For this lab, we were sanctioned Rs 20 crore from the government, but the money has not come yet," says Shekhar Chaudhuri, Director, IIM-C.
At another level, B-schools are layering functional programmes with courses that equip students with soft skills. IIM-L, for instance, has an elective on leadership through literature. And Pramath Sinha, founding dean of ISB Hyderabad, has initiated an alternative value-add to education with The Young India Fellowship, a oneyear course in New Delhi that includes subjects such as Listening, Psychology, Plato's Republic (Philosophy), and Critical Thinking and Writing, besides regular management content. A big change on the horizon is The Foreign Education Bill, which once approved by Parliament, will allow the entry of foreign universities and other education providers into India. Should our B-schools be worried? "Yes, good institutions are likely to come, and we could all do with some healthy competition," says IIM-A's Barua. Some are already here. For instance, Glasgow-based Strathclyde Business School has set up the Strathclyde SKIL Business School (SSBS) in Greater Noida partnering the Nikhil Gandhi-promoted SKIL Infrastructure. "Strathclyde will completely control the quality of education by providing the curriculum, faculty and also student exchange for a term," says Bhimaraya Metri, Dean of SSBS, who recently joined it from Management Development Institute (MDI) Gurgaon. GD Goenka Group, partnering the UK's Lancaster University, launched GD Goenka World Institute in Sohna near Gurgaon in 2009, which offers a two-year postgraduate diploma in business management. And the GMR Group has announced its decision to collaborate with Schulich School of Business of York University, Toronto. But it would be inaccurate to assume that Indian B-schools will be lightly regarded once the foreign biggies swagger in. A case in point is 24-year-old Gopal Balakrishnan, a first-year student at IIM-A. He had Berkeley, Harvard and Columbia in his consideration list while interning at Cisco after his engineering degree at Sardar Patel Institute of Technology, Mumbai. But on getting a call from IIM-A (where he had also applied along with ISB), his decision was clear. "The opportunity cost here is terrific. Besides, India is where the growth and opportunities are," he says. The Foreign Education Bill also brings the matter of autonomy of Indian B-schools into sharp focus. "How is it that we struggle to prove our worth but do not have any say in designing the curriculum, whereas the foreign players can fix student fees, faculty compensation and design their own curriculum totally unhindered," asks H. Chaturvedi, Director, Birla Institute of Management Technology (BIMTECH) at Greater Noida. Last year, the All India Council for Technical Education (AICTE) triggered acrimony by sending a notification to state-funded B-schools which sought to curb their power to design their course curriculum and duration, determine their fee structures, and even their selection of an examination model for students. While IMI's Singh feels AICTE's role is not only to grant approvals, he also questions its attempt to paint all institutes - including established ones such as IMI and XLRI - with the same brush. The IIMs, of course, can now choose their own directors, but according to IIM-C's Chaudhuri, faculty fee is an issue. "If we had the freedom to match salaries of US universities, we could have drawn better talent," he says. "But this may not be possible given the cost structure and environment in our country." In a double-whammy, what also hurts is the lack of good faculty. The Department of Management Studies (DMS), IIT Delhi, for instance, needs at least 23 people now, according to Sudhir K. Jain, Head of Department. "We follow stringent selection norms. The entire academic background has to be sound. That's why a large majority of those who apply to us fails to fulfil the criteria," he says. Even as the business education community grapples with autonomy and faculty issues, a positive change is beginning to happen at another level. Corporate consortiums are aiding institutes, not just with funding, but also with time to help develop curriculum and mentor students. For instance, the School of Inspired Leadership (SOIL) in Gurgaon, was co-created in 2009 by a consortium of 32 companies. When Anil Sachdev, Founder and CEO of SOIL, started the venture, he approached his former consulting clients. Luckily, he did not need funding support, but he asked them to invest time in co-creating the curriculum and also in mentoring students closely. "From day one, each student has a mentor from the industry who spends time with him or her on key issues," says Sachdev. Great Lakes Institute of Management in Chennai, founded in 2004 by Kellogg professor Bala V. Balachandran, has five centres of excellence partnering TVS Capital Funds, which created the T.S. Srinivasan Chair Professor of Entrepreneurship for conducting research in entrepreneurship. Union Bank of India helped create the Union Bank-Great Lakes Center for Banking Excellence and a Faculty Chair as part of this. Surely these are welcome moves for an industry feeling the pinch of not having enough employment-ready talent. "There has to be an investment from our side where we aid institutions in understanding our requirements," says Chandrasekhar Sripada, Head of Human Resource, IBM India/South Asia, which helps some B-schools design their programmes. B-schools are also just beginning to wake up to the power of their alumni network. "The initial response to fund and to partner the institute in mentoring students has been terrific," says IIM-A's Barua. The emotional connect certainly helps. "IIM Bangalore helped me with my discipline and perspective, and also in valuing work-life balance," says Sonjoy Chatterjee, a 1994 batch graduate and Chairman of Goldman Sachs India (Securities). This respect translates into hires from the institute. As India's business education ecosystem evolves and matures to prime itself for a world where India and Indian companies will play an increasingly key role in the global economy, change will indeed be the only constant going ahead. Heraclitus, you see, was a truly wise man.